Don’t let the summer heat get you down. 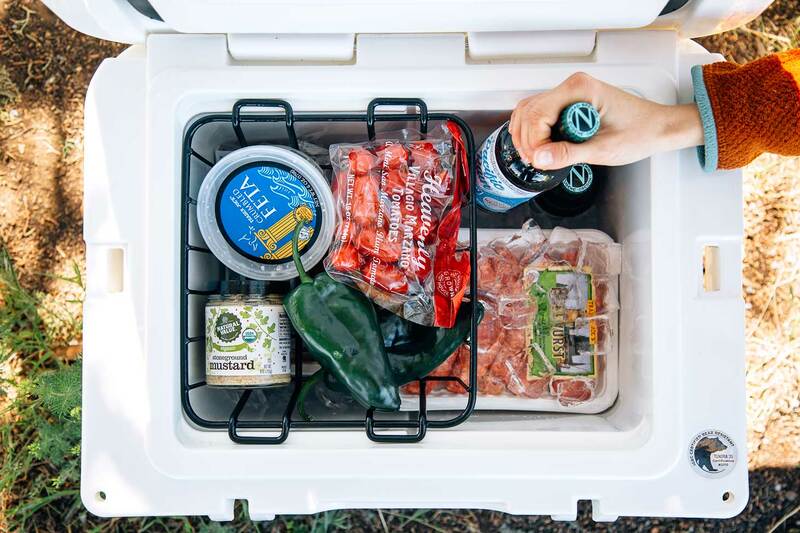 We share our tips and tricks on how to pack a cooler for camping so your food and drinks stay colder, longer. This is how we use to think about packing our cooler. The truth is we didn’t really give it much thought. But after a critical miscalculation left us eating questionably refrigerated food and ultimately scrambling to locate more ice, we decided it was time to get serious about our cooler. Since then we’ve learned a lot. After doing a bunch of research and trying out a couple of techniques, we’ve compiled some best practices for packing a cooler. So before the summer camping season hits, take a moment and learn how to pack your cooler like a pro. If you have any thoughts or tips that you use to pack your cooler, let us know down in the comments. We’re always looking to improve our technique. 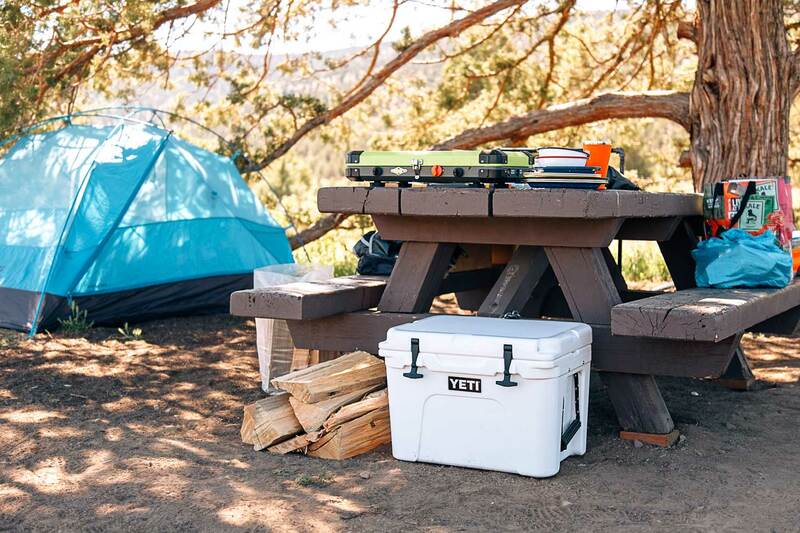 Upgrade Your Cooler – Cooler insulation has improved dramatically over the past couple years with brands like Yeti, Pelican, Orion, and even Cabelas, putting out some really incredible products. We’re talking rotomolded coolers with insulation at least 2” thick. After years of using a $20 Rubbermaid cooler, we upgraded to a Yeti Tundra 35. 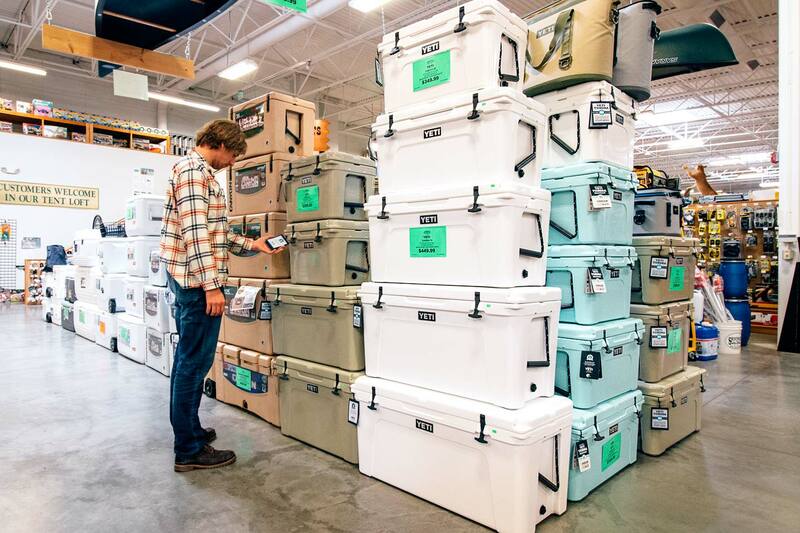 While we haven’t tested every cooler on the market, our Yeti has completely exceeded all of our expectations. 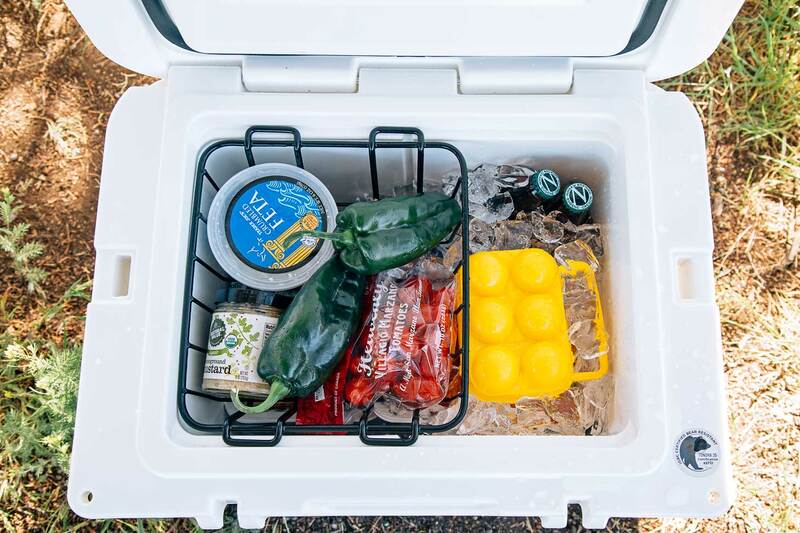 Two Cooler System – Depending on your group size and your budget there’s a strong argument to be made for having one cooler specifically for food and one cooler specifically for beer & other drinks. The drink cooler is going to be opened a lot more frequently and will, therefore, warm more rapidly. Digging underneath your food to find a cold beer at the bottom is not only a hassle but a major waste of energy. So if you can afford it, a second cooler can really help your perishable food items stay colder and safer for longer. Bring Your Cooler Inside – If you store your cooler in a hot attic, shed, or garage, bring it inside at least a day before your trip. You want the cooler’s core temperature to be as cold as possible. Clean Thoroughly – Chances when you got back from your last trip you didn’t do a great job cleaning the cooler. Take a moment now wash it down with a disinfectant spray. One of the best ways to increase food safety is to start with a squeaky clean cooler. Pre-Chill – To really lower the core temperature of your cooler, fill it with cold tap water (hose water) and add a bag or two of “sacrificial ice” at least 12 hours before your trip. Dump this ice water right before you pack your cooler. Prep Food – To save space, you will want to prep as much of your food at home. Pre-chop your veggies and make the marinade ahead of time. Portion out condiments into smaller vessels if you don’t need the whole bottle. The less space the food takes up in the cooler, the more room there is for ice. Remove Excess Packaging – Store packaging can take up a lot of extra space, so remove what you can. There’s no need to bring a whole carton of eggs if you only need 6 and you definitely don’t need the cardboard caddy that comes with a six pack of beer. Transfer to leak-proof containers – Another reason to remove store packaging is because it’s usually not resealable. Assume everything in your cooler is going to get wet (because it will). So unless you want your half opened packet of hot dogs floating next to your beer cans, we suggest transferring everything into reusable, leak-proof containers. 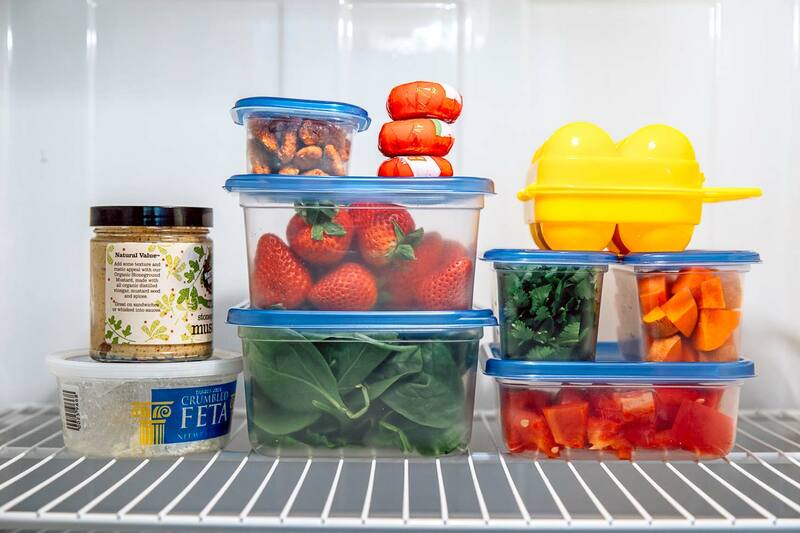 Freeze – For longer trips, you will want to freeze as much of your food as possible. Obviously, don’t freeze the food you’ll need to eat on the first night. But if you plan on having steak on the last night of your trip, freeze it. You can also freeze water bottles, but be sure to dump ¼ of the liquid to allow for it to expand. Refrigerate – Everything that is not being frozen should be refrigerated before being packed. That includes resealable food containers. Really nothing should go into the cooler that’s at room temperature, otherwise, you waste your ice cooling things down instead of just keeping cold things cold. Block Ice & Freezer Packs – The best ice foundation is either block ice or large reusable freezer packs. These solid blocks of ice take much longer to melt than ice cubes. Place these at the bottom of your cooler and build on top of them. Don’t have reusable freezer packs? Try freezing a bottle waters (singles or gallons) with about 1/4 of the water removed from inside so the ice can expand. Lay horizontally inside your freezer. Ice Cubes – While ice cubes melt faster than block ice, they do a great job of filling in the cracks. So fill the spaces in between your food items with ice cubes. Dry Ice – For extended trips, consider using dry ice. Dry is extremely cold and will freeze anything it touches (including your fingers) so be very cautious with how you handle it. For more information about using dry ice, Yeti has a good article about it. Last Thing in the Car – Wait until you’re about to get in the car before you start packing your cooler. This should be the last thing you do before you walk out the door. Block Ice on Bottom – Begin with a layer of block ice on the bottom, then back in food items in reverse order. Starting with the last day’s food on the bottom, work your way up so the first day’s food is sitting on top. Ice Cubes In Between – Air is the enemy. Large pockets of air inside your cooler will accelerate ice melt. So fill up as much of that space as you can with ice cubes. This Side Up – Play it safe and assume everything might leak. When placing containers with liquid, make sure they are placed vertically. Meal Categories – Pack breakfast foods to the left and dinner foods to the right. That way you’re not searching all over for your ingredients when it’s time to cook. Map it Out – If you have a have a particularly large cooler, it helps to make a quick cooler map so you know where things are located (minimizing the time your cooler is left open while you search for what you’re looking for). Transportation – When loading your vehicle, keep the cooler inside the car with you. Avoid putting it in a hot trunk where it is apt to overheat. Keep it Shaded – At the campsite, place your cooler under a picnic table or somewhere else shaded. The sun is a heat source and you’ll want to avoid direct sunlight as much as possible. You can place a wet towel over the top of it to help insulate it further. Keep it Closed – The single biggest factor in how long the ice in your cooler will last is how often it is opened and exposed to outside temperatures. Keeping it closed keeps it cold. Do Not Drain Meltwater – While it might go against conventional wisdom, it has been scientifically proven that it is better to leave the meltwater in the cooler than to drain it. Knowledge is Key – If you really want to know what’s going on inside your cooler, consider buying a small food thermometer and attach it inside. That way you’ll know at a glance whether food is being stored safely (temp below 40 F). Reflection – Use reflective paneling on your cooler to help prevent it from heating up in direct sunlight. Thanks a lot for sharing such great tips on packing a cooler perfectly. I lay clean dish towel on top of everything before I close the lid. It reduces the amount of air around the food and keeps everything colder for longer. I have a standard cooler and found that the ice can last up to two days with this method. Helpful tips. Thanks for sharing. I think YETI coolers are best for keeping foods for longer time. I am using one and it is really great. YETI (and really any of those roto-molded high-end coolers) are in a league of their own. WAY better than the old school coolers we used to use. For this tip there’s no substitute. It’s not just about buying a rotomolded cooler but knowing how to properly pack your cooler. That’s what matters most! How to pack a cooler like a pro? A cooler is a MUST have in every camping trip. You must select the perfect cooler base on the number of days you’ll go camping, the things that you will bring, the activities that you plan to do, and so much more. Here’s a pretty thorough comparison of coolers from the folks at Overland Journal. And if/when we take eggs, we crack them into zip lock bags. 3 per baggie for me, 2 per baggie for her. Leave the shells at home. Pour into the hot pan at the campsite/Basecamp… shredded cheese, onions and green peppers and mushrooms added to a bag or two with the eggs for an “instant omelet” meal. I prep our scrambled eggs and freeze. Lightly beat the number of eggs, put in a bag/container then freeze. It works great! We’ve also tried omelets in a bag, prep everything at home in a freezer ziploc, freeze(or not), at campsite boil some water and place the omelet bag in the water approx 10min. Quick clean up and the hot water is ready to do dishes. We use wide-mouth plastic containers, preferably squarish in shape (the kind in which rice blends or nuts come in), to make ice blocks before we leave – the fresh water can be transferred into our water jug as it melts; the containers can then be easily refilled with ice cubes along the way, keeping the melt water off the food in the cooler. We also use large freezer bags to hold pre-frozen homemade chili, pasta sauce, beef stew, butter chicken, pulled pork, etc. for the same reason as Linda does. We’ve had our coolers (one large and one medium-sized) for years, thanks for the tip about recent improvements – we’ll be looking into that. I like to use zip lock freezer bags, rather than containers for frozen food. Think tamale pie filling. It can either lay flat or stand up along a wall. My goal is to not pack any air, ever. Then you don’t have to figure out where there is room for the empty container. The empty bag becomes your trash bag for the night, or a place to store leftovers. Also, found something on Pinterest for tiny amounts. Use plastic drinking straws for spices, toothpaste (single use) and such. Pinch end with needle nose pliers, use flame to seal, fill, seal other end, and label. Fat shake straws hold more. Have not tried it yet, but sounds good. These are great suggestions! Thank you so much for sharing. Agreed with trying to pack a little air as possible. Ziplock bags would definitely offer more versatility in stacking/organizing. We’ll have to give it a try.